Home › Queensland › Darling Downs Solar Farm sold by Origin to APA Group. The Darling Downs Solar Farm, previously owned by Origin Energy Ltd, has been sold to pipelines owner APA Group. According to Sky News it was a $220 million deal. The project (it isn’t built yet and is slated to reach completion in 2018) will be located near Dalby, next to an existing 644MW gas-fired generator. The PV Solar Farm will be constructed with 110MW capacity and Origin have already signed a 12 year purchase power agreement (from 2018 – 2030) to receive the energy output of the farm. 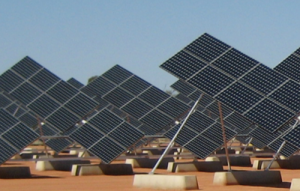 The $220m project was the biggest to come out of the Australian Renewable Energy Agency (ARENA)’s recent large scale solar tender – receiving $20m from them to support the infrastructure. This funding will now go directly to APA to complete the project. Origin CEO Frank Calabria has been quoted by saying that Origin have added more than 650MW of power to their portfolio recently and are confident they’ll be able to reach their share of the renewable energy target. The Darling Downs Solar Farm is the second solar acquisition for APA Group – it’ll follow the Emu Downs Solar Farm facility in Western Australia. It will be built alongside the Emu Downs Wind Farm and was funded by ARENA as well, with $5.5m being awarded for the $20m 20MW Cervantes farm which will encompass 80,000 solar panels over 70 hectares. It is expected to be completed by this December. ← Tasmanian Solar figures show Launceston leading the charge.